While Iron Man 3 was certainly better than Iron Man 2, it's most notable (at least for me) for making the wait for Avengers 2 all that more difficult. To tide us over for awhile, lots of companies are producing cool collectibles. 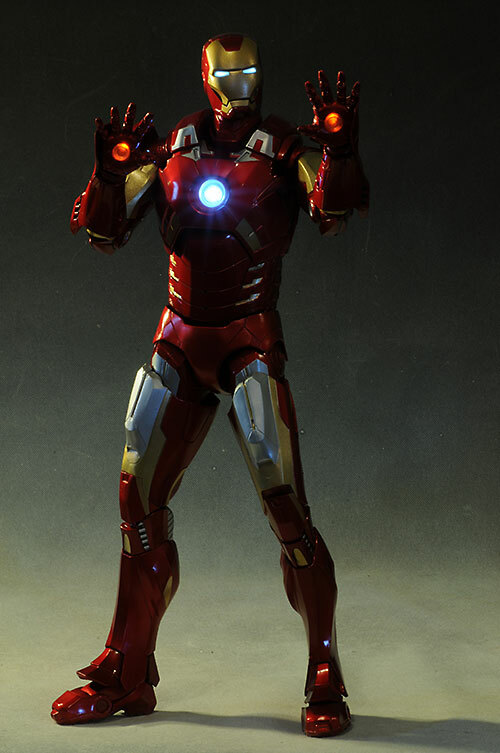 One of my more anticipated was the quarter scale Iron Man from NECA. That's because I love the quarter scale figures they've produced in the past, and I'm thrilled that they are showing the scale and style so much love this year across so many different licenses. 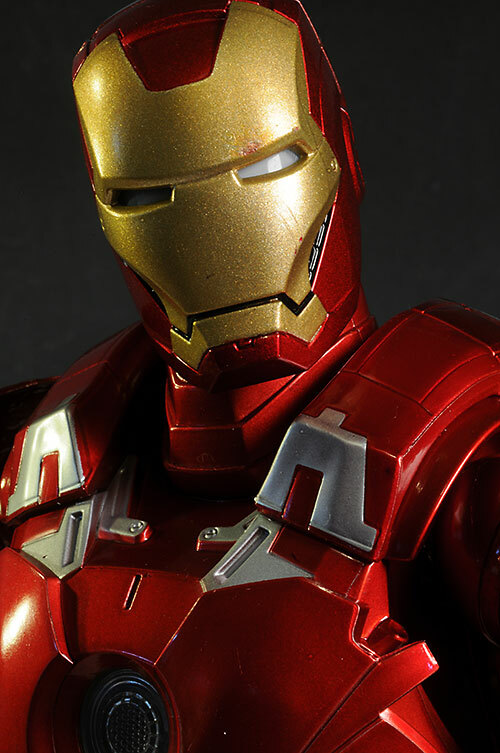 While other companies are producing some very expensive figures in this scale, such as Hot Toys and Enterbay, NECA continues to keep theirs in the sub-$100 range. 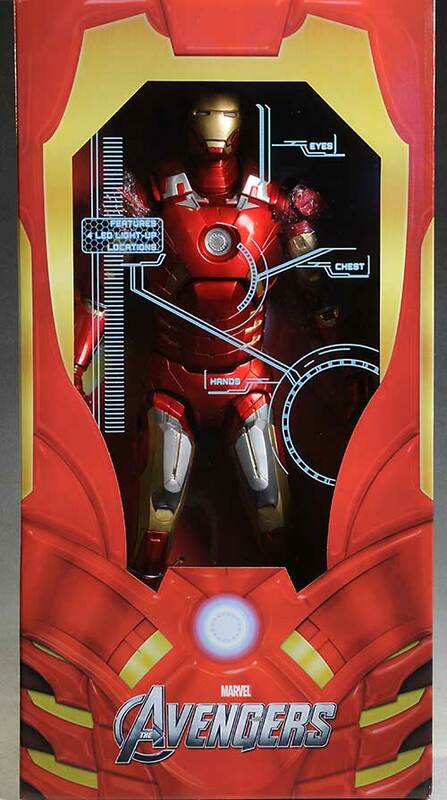 Iron Man is actually one of the more expensive, coming in around $90 - $100, depending on the retailer. There's a rumor that this was limited to just 7500 figures, but there's no COA or other markings on the package to indicate the validity of that. The box is just big enough for the figure, with very little waste. 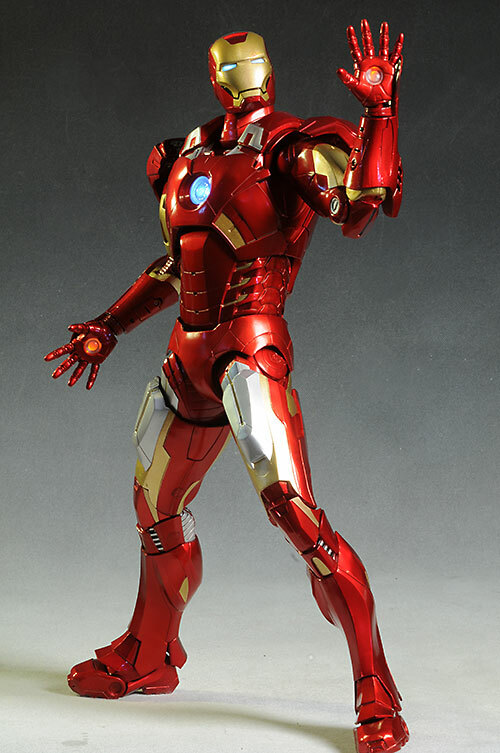 It's also very, very sturdy, and I love how the explanation of the light up feature on the window looks like the controls of the Iron Man suit, as seen through Tony's eyes. There's a couple negatives though. First, there's no 'try me' feature of any kind, which has become a bit of a requirement for most electronic figures. Second, you better bring your wire cutters to this opening party, because there are 13 heavy duty twisty ties keeping this guy confined. 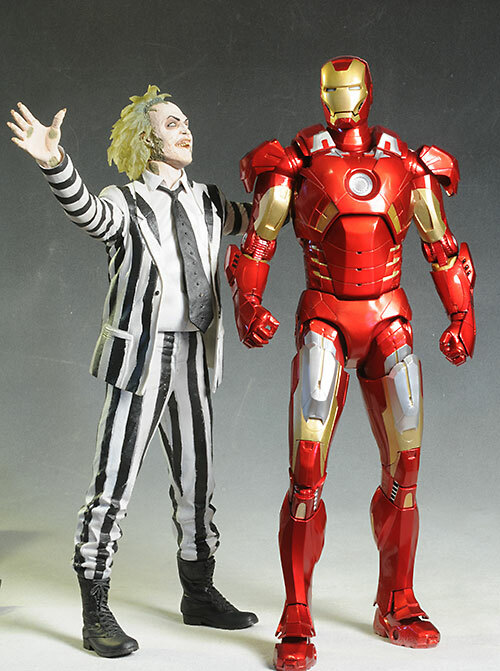 Remember that this figure is quarter scale, which generally means a six foot character is about eighteen inches tall. 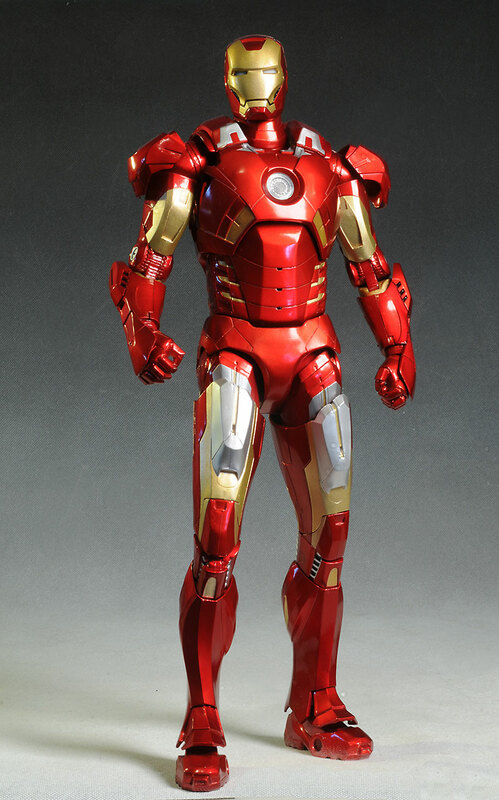 Iron Man is just over that, almost 18 1/4". He's definitely big, definitely heavy, much heavier than buyers of previous NECA figures this size might expect. 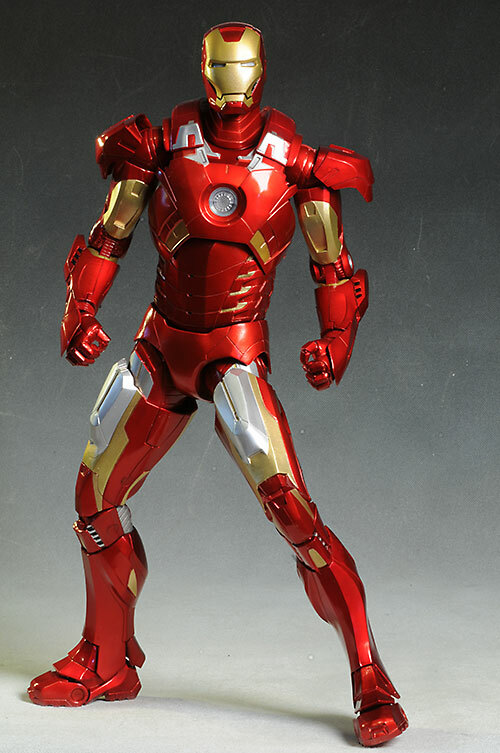 I believe this is supposed to be the Mark VII suit, and it looks great. It did seem as though the torso was a little bulky, or more bulky than we're accustomed to with most collectibles, but I think that might be because most collectibles are underestimating the size of the person inside the armor. The overall design is quite impressive as well, with the sculpt engineered to work well with the increased articulation, and still hide the joints. The shoulder armor is a little funky, depending on how you pose it. It is articulated so that it doesn't get too much in the way of the arms, especially when they are raised about the 90 degree plane of the body. But that feature can make them stick out a bit weirdly too, especially in the more at-rest poses. The overall paint quality is excellent, with little slop and no over spray or weak cut lines. The colors are bright, and largely consistent across the coverage. My one big negative here is on the mask itself. On mine, there are several small, distinct scratches in the paint (and surface) on the left side, above and below the eye. It actually looks like battle damage...except that there isn't supposed to be battle damage on this figure, and there isn't any anywhere else on his armor. Less of a problem but still worth mentioning is a plasticy look to the silver pieces. Silver is always a tough color to pull off well, but here the parts loose their faux metal appearance and take on a basic plastic look, which I think is caused by the way the silver was done. For buyers of previous NECA quarter scale figures, this will be the biggest surprise. Usually these figures have very limited articulation - a ball joint here, a cut joint there, something basic to keep them standing. 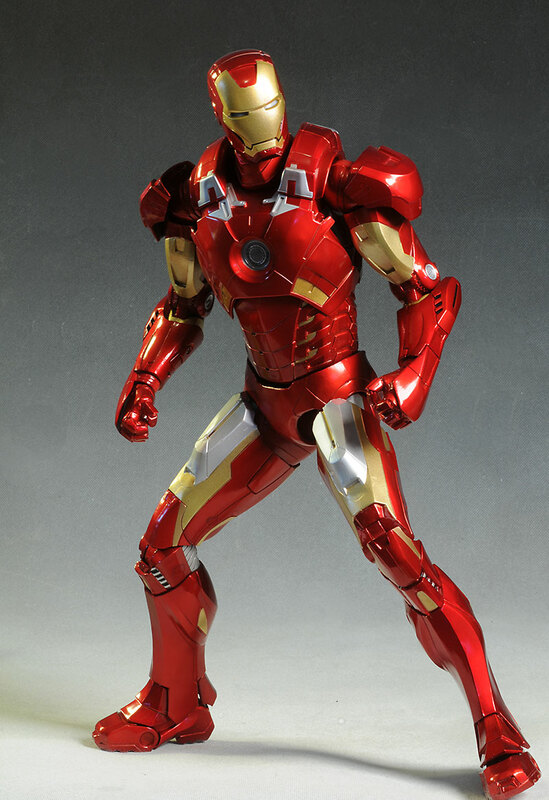 But NECA decided that even though this figure has a design that makes articulation difficult to begin with (all that armor certainly gets in the way), they'd up the ante and provide real posability. There's a terrific ball jointed neck, as well as ball jointed shoulders, wrists and hips. The shoulders and hips are the pin and disc style, and they are 'clicky' as well, making him more likely to not just take a deeper stance, but maintain it. There's also pin elbows, knees and ankles, an ab-crunch, cut thighs, biceps and a cut waist. Both the shoulder armor and the armor over the top of the foot are articulated as well, to allow it to get out of the way of more extreme poses. There's even a pin joint at the mid-foot! That makes him far more articulated and poseable than most of the NECA releases in this scale, and it's a welcome improvement. He comes with one extra set of hands, fisted. They swap with the open palms, but don't light up...as you'd expect, unless Tony wanted to blow his fingers off. 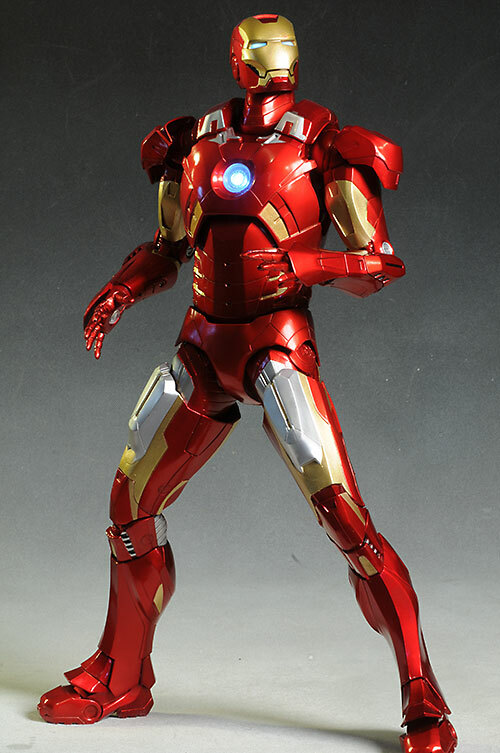 While that is pretty light, it's not a huge deal for me because a) Iron Man isn't a figure that doesn't lend himself to a ton of extras and b) the price is right. 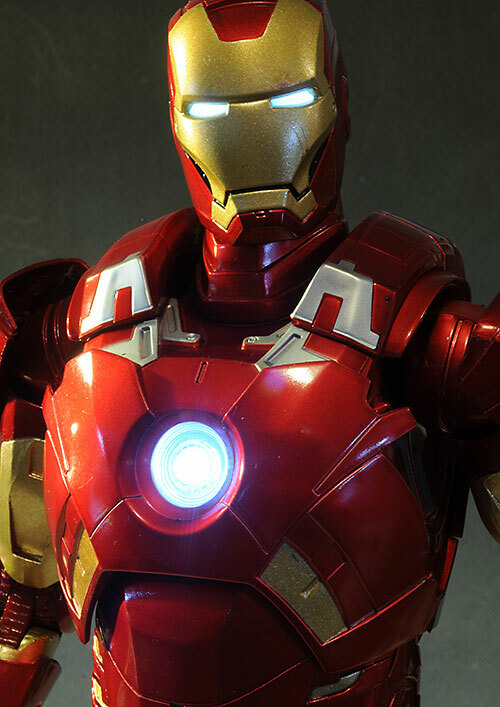 There are four different spots that light up - his eyes, each palm, and of course the ARC reactor on his chest. These LED lights are nice and bright, and the batteries are included, always a big plus. It's also worth noting that putting the batteries in shouldn't be too much of an issue when it comes time to replace them, since the small compartments are easy to get to. Likewise the switches, which are well placed. As I said, I believe this is the MKVII, and I don't remember the hands being a different color than the eyes and chest. Here, the eyes and chest are the usual blue-white, but the palms are a definite orange-red.It's not just that the hands are red and the color has made its way onto the palms - the LED's in the wrists are red. I'm docking them here for the color change, since I don't remember it that way (and it wouldn't make a lot of sense - it's all the same power source), but it's possible that I'm jut not remembering it correctly. If so, I apologize in advance. The great articulation and well done light up feature make this a terrific toy for kids. Stack him up against one of their recent Predator releases in this scale and you'll have a back yard battle royale! Back when NECA was first cranking out the 18" figures (following up on McFarlane's success with the style, and carrying it to new heights), they usually cost $50 - $60 each. This was 2006 - 2008, and then prices started to rise, reaching the $80 - $100 with some releases. Good examples of these higher costs were SOTA's Lord of Darkness and Pumpkinhead. That's a long way of saying that in today's market, where I'm paying more than four bucks for a gallon of gas, the $100 price tag for an 18" figure with this much articulation and a very well done light up feature is not excessive at all. While he might not have quite the level of quality of an Enterbay quarter scale figure, he's not $400 either. Swapping the hands can be a little tough, but a hair dryer may make that easier. Just take care with the light up feature in the wrists. This is an excellent scale for NECA to work in, allowing them to showcase some really cool sculpts and paints. They've upped the articulation with recent releases as well, which is a trend I hope we see continue. While these aren't quite Enterbay or Hot Toys quality, they are certainly good enough to take a spot in your home theater or man (nerd) cave. - Entertainment Earth has him at $90. - comes in at $120. Other great quarter scale figures include Gollum, Aragorn, Gandalf, classic Predator, Hellboy, Abe Sapien, Alien, Lord of Darkness, Pumpkinhead, and a whole bunch more.